Uganda v Ghana (Saturday) A contingent of 30 Ghana Black Stars players and officials jets into the country at 2:40pm tomorrow afternoon, ahead of the 2006 World Cup/African Nations Cup group two clash with the Cranes on Saturday at Namboole Stadium. Mr Alexandra Asante, Ghana Football Association's Protocol Officer, told The Monitor on phone from Accra, Ghana that: "The team currently in Mozambique will fly to Johannesburg, South Africa where they will board South African Airways." Asante said the contingent has 21 players with the rest being officials. An advance party, including the minister in charge of sports and two journalists, were due last night aboard Kenya Airways. The Black Stars have been camping in Mozambique for the past 11 days on a training tour. Last Friday they beat their hosts 1-0 in a build-up match. The players are talking of revenge ahead of the Saturday clash, according to Ghana's press. They have vowed to dismantle the Cranes in their own backyard. The paper wrote: "The Stars' World Cup qualifier against the Cranes evokes memories of the past. Parading as age-old underdogs in African football, the Cranes braved all odds and battled the Stars to a 1-1 draw in Kumasi last year. 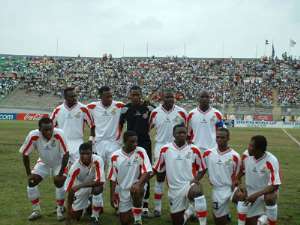 The result and a subsequent 1-0 defeat by Rwanda in Kigali put paid to Black Stars' march into the 2004 Nations Cup finals in Tunisia, denying the four-time African champions a seventh successive appearance at the continental event. The Germany based Sammy Kuffour (Bayern) and Ibrahim Tanko (Freiburg) have vowed revenge on the Cranes." Stephen Appiah (Juventus, Italy), Sammy Kuffour (Bayern, Germany), John Mensah (Modena, Italy), Ibrahim Tanko (Freiburg, Germany), Sulley Muntari Ali (Udinese, Italy,) Michael Essien (Lyon, France), Yakubu Abubakar (Ajax, Holland), Baffour Gyan (Dynamo Moscow), Richard Kingston (Turkey), Augustine Ahinful (Turkey), Kwadjo Poku (Midjtland, Denmark), Emmanuel Duah, Emmanuel Pappoe (Israel), Kofi Amponsah, Bismark Ekye (Fiorentina, Italy), Sammy Adjei (Hearts), Ablade Morgan (Hearts), Daniel Coleman (Hearts), Daniel Quaye (Hearts), Lawrence Adjei (Hearts), Amankwa Mireku (Hearts), Charles Taylor (Kotoko), George Owu (Kotoko), William Tiero (Kotoko), Abubakar Yahuza (King Faisal) and Hamza Mohammed (King Faisal).